↑ Sir Michael Somare (2004-12-06). "Stable Government, Investment Initiatives, and Economic Growth". Keynote address to the 8th Papua New Guinea Mining and Petroleum Conference (Google cache). अभिगमन तिथि 2007-08-09. ↑ "Never more to rise". The National (February 6, 2006). अभिगमन तिथि 2005-01-19. ↑ संयुक्त राष्ट्र, Department of Economic and Social Affairs Population Division (2009). World Population Prospects, Table A.1. 2008 revision. UN.org. Retrieved 2009-08-28. 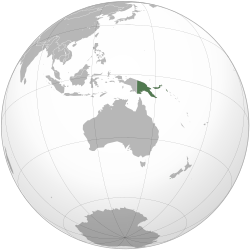 ↑ अ आ इ ई "Papua New Guinea". International Monetary Fund. अभिगमन तिथि 2010-04-21. ↑ मलिक, खालिद (2014). Sustaining Human Progress: Reducing Vulnerabilities and Building Resilience (pdf). Human Development Report 2014. न्यूयॉर्क: संयुक्त राष्ट्र विकास कार्यक्रम. पृ॰ 162. आई॰ऍस॰बी॰ऍन॰ 978-92-1-126368-8. अभिगमन तिथि 28 जुलाई 2014.